На отель в центре Италии обрушилась снежная лавина, передает Reuters: "Инцидент произошел в среду, 18 января. Лавина сошла на гостиницу «Риджопиано» в провинции Пескара региона Абруццо." Indeed! Around 100,000 in Abruzzo without power - English - Very Imp-p-p-pressive! The president of Italy's Marche region has talked of a "catastrophe" and appealed for aid as four quakes above magnitude 5 struck in one day. Luca Ceriscioli said quakes and snow had caused landslides and thousands of families were suffering power cuts, with some villages left isolated. A man was killed and another reported missing in the nearby Abruzzo region. European Commission President Jean-Claude Juncker vowed EU solidarity with Italy after the tremors. The Lazio region was also affected on Wednesday and the tremors were felt in the capital, Rome. In Teramo, Abruzzo, a man of 83 was found dead in the rubble of his barn which had collapsed, while in Ortolano, also in Abruzzo, a man was swept away by an avalanche, Italy's Ansa news agency reports. The Italian Institute of Geophysics and Volcanology said it had recorded "some 200" tremors above magnitude 2 on Wednesday in Abruzzo and Lazio. The first big quake struck at 10:25 (09:25 GMT) with a magnitude of around 5.3, followed at 11:14 with one of 5.4, followed some 11 minutes later by another of 5.3, the institute said (in Italian). At 14:33, a fourth quake measuring 5.1 occurred, the institute says. The first three were around 9km (5.6 miles) in depth, meaning they were dangerously close to the surface, while the fourth was even shallower, at 6.9km deep, according to the US Geological Survey. In the Abruzzo village of Montereale, south of Amatrice, farmer Nello Patrizi, 63, told AFP News agency: "It was an apocalyptic shock. We were petrified. "The first [quake] was bad enough, the others seemed even stronger. You had the impression everything was collapsing, people were screaming. It was a terrible thing. People were given shelter in a large tent erected on a sports ground in Montereale. Nella Regione ancora blackout elettrico per 87mila persone a causa dell'emergenza neve e la situazione più grave riguarda la provincia di Teramo. A fornire l'aggiornamento è il presidente dell'Abruzzo, Luciano D'Alfonso, sulla sua pagina Facebook. На отель в центре Италии обрушилась снежная лавина, передает Reuters. Инцидент произошел в среду, 18 января. Лавина сошла на гостиницу «Риджопиано» в провинции Пескара региона Абруццо. В настоящий момент пропавшими без вести числятся три человека. Однако, по другим данным, в отеле в момент схода лавины находились 20 постояльцев. Власти выясняют обстоятельства произошедшего, на место направляются спасатели. Why has the West been so supportive of Palestinian nationalism, yet so reluctant to support the Kurds, the largest nation in the world without a state? The Kurds have been instrumental in fighting Islamic State (ISIS); have generously accepted millions of refugees fleeing ISIS to the Kurdistan Regional Government (KRG); and embrace Western values such as gender equality, religious freedom and human rights. They are also an ancient people with an ethnic and linguistic identity stretching back millennia and have faced decades of brutal oppression as a minority. Yet they cannot seem to get sufficient support from the West for their political aspirations. The Palestinians, by contrast, claimed a distinct national identity relatively recently, are less than one-third fewer in number (in 2013, the global Palestinian population was estimated by the Palestinian Authority to reach 11.6 million), control land that is less than 1/15th the size of the KRG territory and have not developed their civil society or economy with nearly as much success as the Kurds. Yet the United Nations, the European Union, the Arab League and other international bodies have all but ignored Kurdish statehood dreams while regularly prioritizing Palestinian ambitions over countless other global crises. Indeed, in 2014 the UK and Sweden joined much of the rest of the world in recognizing a Palestinian state. There has been no similar global support for a Kurdish homeland. Moreover, Kurdish statehood has been hobbled by US reluctance to see the Iraqi state dismantled and by regional powers like Turkey, which worries that a Kurdish state will stir up separatist feelings among Turkish Kurds. With an estimated worldwide population of about 35 million (including about 28 million in the KRG or adjacent areas), the Kurds are the fourth-largest ethnic group in the Middle East (after the Arabs, Persians and Turks), and have faced decades of persecution as a minority in Turkey, Iran and Iraq. The 1988 “Anfal” attacks, which included the use of chemical weapons, destroyed about 2,000 villages and killed at least 50,000 Kurds, according to human rights groups (Kurds put the number at nearly 200,000). Several international bodies have recognized those atrocities as a genocide. The drive for Kurdish rights and separatism in Iran extends back to 1918, and – during its most violent chapter – cost the lives of over 30,000 Kurds, starting with the 1979 rebellion and the consequent KDPI insurgency. A 2007 study notes that 300,000 Kurdish lives were lost just in the 1980s and 1990s. The same study states that 51,000 Jews and Arabs were killed in the Arab-Israeli conflict from 1950 until 2007 (and, because that total includes wars with Israel’s Arab neighbors, Palestinians are a small fraction of the Arab death toll). Perhaps because of the Kurds’ own painful history, the KRG is exceptionally tolerant toward religious minorities and refugees. The KRG has embraced its tiny community of Jews, and in 2014 the Kurds rescued about 5,000 Yazidis trapped on Mount Sinjar after fleeing attempted genocide by ISIS. Last November, the Kurds recaptured the Sinjar area from ISIS, liberating hundreds more Yazidis from vicious oppression. The KRG absorbed 1.8 million refugees as of December, representing a population increase of about 30 percent. The KRG reportedly needs $1.4 billion to $2.4b. to stabilize the internally displaced people in its territory. “Most of the refugees [in the KRG] are Arab Sunnis and Shia, Iranians, Christians and others,” Nahro Zagros, Soran University vice president and adviser to the KRG’s Ministry of Higher Education, told the IPT. “Yet there is no public backlash from the Kurds. Masrour Barzani, who heads the KRG’s intelligence services, says that Kurdish independence would empower the Kurds to purchase the type of weapons they need without the delays that currently hobble their military effort against ISIS. Under the present arrangement, Kurdish weapons procurement must go through Iraq’s Shi’ite-led central government, which is also under heavy Iranian influence. 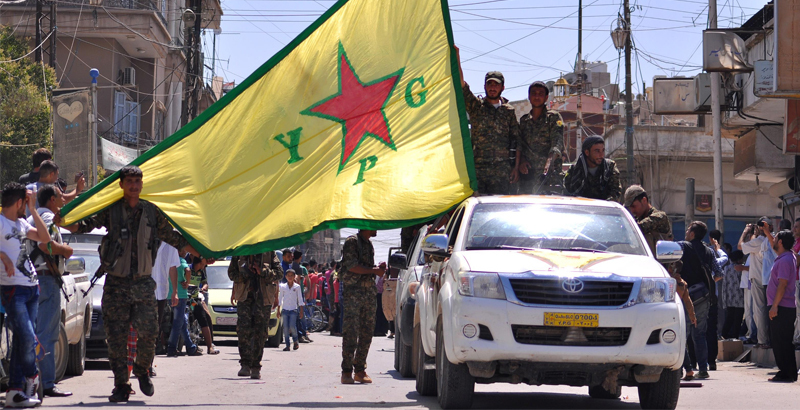 Besides bolstering the fight against ISIS, there are other geopolitical reasons for the West to support Kurdish statehood: promoting a stable partition of Syria, containing Iran, balancing extremist forces in the Middle East and giving the West another reliable ally in a volatile region. Southeast Turkey and northwest Iran also have sizable Kurdish areas that are contiguous with the KRG, but those states are far from disintegrating and would aggressively resist any attempts to connect their Kurdish areas to the future Kurdish state. However, the Kurdish areas of former Syria should be joined to Iraqi Kurdistan as a way to strengthen the fledgling Kurdish state and thereby weaken ISIS. In a recent article, Ernie Audino, the only US Army general to have previously served a year as a combat adviser embedded inside a Kurdish Peshmerga brigade in Iraq, notes that Iran currently controls the Iraqi government and Iran-backed fighters will eventually try to control Kurdistan. He also makes the point that Western support for the Kurdish opposition groups active in Iran would force the Iranian regime to concentrate more on domestic concerns, effectively weakening Iran’s ability to pursue terrorism, expansionism and other destabilizing activities abroad. Because the Kurds are religiously diverse moderates who prioritize their ethno-linguistic identity over religion, a Kurdish state would help to balance out the radical Middle East forces in both the Shi’ite and Sunni camps. The Kurds are already very pro-American, thanks to their Western-leaning values, the US-backed-no-fly zone, and the 2003 toppling of Saddam Hussein that made the KRG possible. A Kurdish state would also have excellent relations with Israel, another moderate, non-Arab, pro-Western democracy in the region. Prime Minister Benjamin Netanyahu endorsed Kurdish independence in 2014, and Syrian Kurds – after recently declaring their autonomy – expressed an interest in developing relations with Israel. By contrast, the Palestinian Authority slanders Israel at every opportunity: PA President Mahmoud Abbas recently claimed in front of the EU parliament that Israel’s rabbis are trying to poison Palestinian drinking water. The PA raises Palestinian children to hate and kill Jews with endless anti-Israel incitement coming from schools, media and mosques. Palestinians have also shown little economic progress in the territories that they do control, particularly in Gaza, where Palestinians destroyed the greenhouses that donors bought for them in 2006 and instead, have focused their resources on attacking Israel with tunnels and rockets. By almost any measure, a Kurdish state deserves far more support from the West. After absorbing millions of Syrian refugees while fighting ISIS on shrinking oil revenue, the KRG is battling a deepening financial crisis. Aggravating the situation, Iraq’s central government has refused – since April 2015 – to send the KRG its share of Iraqi oil revenue. The economic crisis has cost the KRG an estimated $10b. since 2014. US Rep. Ed Royce (R-California), chairman of the House Foreign Affairs Committee, introduced House Resolution 1654 “to authorize the direct provision of defense articles, defense services, and related training to” the KRG. Fifteen months later, the bill is still stuck in Congress. Helping the Kurds should be an even bigger priority for the EU, which absorbs countless new refugees every day that ISIS is not defeated. If the EU were to fund the KRG’s refugee relief efforts and support their military operations against ISIS, far fewer refugees would end up on their shores. The writer is the author of The Last Israelis, an apocalyptic novel about Iranian nukes and other geopolitical issues in the Middle East. Syrian deputy Foreign Ministry rejected on Wednesday the participation of Saudi Arabia and Qatar in the Astana peace talks on Syria next week, stressing that negotiations should not include every party that supports, arms and funds terrorism. “Once Qatar and Saudi Arabia halt their support to terrorism, then we can discuss their participation in the talks,” he said. Speaking to Al-Mayadeen TV, Moqdad said that Washington should prove its sincerity to deal with solutions for the Syrian crisis, prevent the support of armed terrorist groups, and exert pressure on Turkey to close its border with Syria. BEIRUT: Key Syrian rebel group Ahrar al-Sham said on Wednesday it will not take part in peace talks between the government and opposition factions in the Kazakh capital next week. The group decided not to participate in the negotiations in Astana that start on Monday due to "the lack of implementation of the cease-fire" in force since December 30 and ongoing Russian airstrikes over Syria, it said in a statement. Ahrar al-Sham was among rebel groups that signed the cease-fire deal brokered by government supporter Russia and rebel backer Turkey last month. The truce has largely held across Syria although fighting has persisted in some areas, allowing Russia, Turkey and government supporter Iran to organize the peace talks in Astana. Ahrar al-Sham said "the regime's offensive against our people in Wadi Barada,"an area 15 kilometers (10 miles) northwest of Damascus that is the capital's main source of water, was among the reasons it would not attend the talks. Assad's forces have pressed an assault to retake the area from rebels after mains supplies were cut last month, leaving 5.5 million people in Damascus and its suburbs without water. Ahrar al-Sham said however that it was giving its support to other rebel groups represented at the Astana talks. Mohammad Alloush, a prominent figure of the Jaish al-Islam (Army of Islam) faction, will in Astana head a "military delegation" of around eight people, backed by nine legal and political advisors from the High Negotiations Committee umbrella group. Russia started airstrikes in support of Assad's government in 2015. WASHINGTON (Sputnik) — The Syrian peace consultations in Astana are expected to be held on January 23, with the opposition represented as a united bloc. The talks will be followed by a new round of negotiations on Syrian peace in Geneva on February 8. "As you know, General Flynn was invited in a call that he had with the [Russian] Ambassador [to the United States Sergei Kislyak] on December 29," Spicer stated. "I don't have anything to update you on that. But, I think, the scenario is that what President-elect is in, what's going on there [in Syria] is a major concern…We clearly have the desire to work with other countries and nations." With less than a week to the Syria peace talks to be held in Kazakhstan, there is a degree of skepticism over the final outcome of the much-awaited negotiations. The peace talks initiated by Russia and Turkey will see representatives from militant groups as well as the Syrian government sit down at the table in Astana as part of efforts to give an end to the deadly war in Syria. Mohammad Marandi, a professor at the University of Tehran, said the peace talks would not bear fruit unless the United States and its regional allies including Saudi Arabia, change their policies on Syria. The US and its regional allies have already been under fire for fueling war in Syria by supporting militant groups in the Arab country. Washington has not been directly involved the latest diplomacy after failing efforts to lead Syria peace talks. “The United States really does not deserve - under the Obama regime at least - to be at negotiating table,” said the professor of American studies and English literature at the University of Tehran. The US-led alliance to fight Daesh in Syria refused to pound the terrorist group’s position in Dayr al-Zawr, but the alliance helped the terrorists by “intentionally bombing Syrian Army position,” he noted. In September 2016, the United States and Russia brokered a ceasefire in Syria. But the truce failed after the US warplanes targeted a Syrian air base near Dayr al-Zawr in eastern Syria, killing 82 soldiers. Since March 2011, Syria has been gripped by devastating war, which has left hundreds of thousands of civilians dead. Israel entered a new era in air defense today. After years of research and development, the Ministry of Defense Homa Administration (Israel Missile Organization), part of the Administration for the Development of Weapons and Technological Infrastructure, and the US Missile Defense Agency delivered the first new Arrow 3 advanced air defense system interceptors to Israel air force air defense units. 17 years after the Arrow system was first made operational, the Arrow 3 is extending and upgrading Israel's air defense. It provides Israel with new capabilities in intercepting ballistic missiles carrying nuclear warheads while these are still far away from us in outer space. In other words, Arrow 3 interception is not the Iron Dome interception of a Grad missile. Regardless of how much you gaze skyward, you will hear no boom and see no smoke. Today's ceremony at the Palmachim air force base means that if someone in Iran or any distant country presses the button tomorrow, the interception office on duty in the air defense system can launch the Arrow 3 at the missile threat. The advantage of the Arrow 3 is not merely its ability to intercept missiles bearing evil payloads far away from Israel's borders, while preventing complications caused by poisonous and hazardous fallout liable to be emitted following the explosion. Operationally, these missiles are designed to significantly increase the interception opportunities available to Israel when needed. If the first Arrow 3 interceptor fired misses its target missile, and that can happen, the interception officer at one of the Arrow 3 batteries will have enough time to launch another Arrow 3 interceptor at the missile threat. Even if interception does not take place, Arrow 2 interceptors, which have undergone a series of upgrades, revisions, and adaptations since being made operational by the air force, will also be directed at the target missile. The Arrow 2 Block 4 missiles currently possessed by the air force are extremely advanced and up-to-date. They are capable of intercepting all the missiles and heavy rockets in the arsenal of Israel's enemies when the day of decision comes. Even though Arrow 3 missiles have smaller dimensions than Arrow 2 missiles, and there is a significant difference in their interception method, compared with the older Arrow missiles, they can be launched against enemy missiles using the existing infrastructure. A senior Homa source says that declaration of the new missiles as operational requires no substantial changes in the deployment of the missile batteries. These batteries operate from two sites, Palmachim and Ein Shemer, and are connected to the Oren Adir (Magnificent Pine) radar system developed by Israel Aerospace Industries Ltd. (IAI) (TASE: ARSP.B1) subsidiary Elta Systems. "The entire Arrow system is able to work together, and speaks the same language," the source stated. "New and important capabilities have been added to the command and control center and to the radar detection system, whose capabilities against the future threats expected in this area have been upgraded." IAI is the chief contractor in the Arrow 3 program, and US company Boeing is the senior partner. Components linked to the new missiles system are produced in Boeing's US plants, imported to Israel, and assembled in Israel at IAI's Malam factory. With the delivery of the new missile interceptors to the air force, other defense companies can also pat themselves on the back for this achievement and take part in the celebratory occasion by opening several bottles of pink champagne. One of these is Elbit Systems Ltd. (Nasdaq: ESLT; TASE: ESLT), which, together with its Elisra Group subsidiary, developed the missile's firing management system, called Golden Citron. Another is Israel Military Industries Ltd. (IMI), which produced the engine. Although the Arrow 3's operational status is an accomplished fact, and constitutes a real milestone on the way to completion of Israel's multi-layer defense system against missiles and rockets, more trials of the weapons system are expected in the future. The Arrow 2 and Arrow 3 array can now provide a complete solution to any threat to Israel posed, and possibly that will be posed in the future, but it needs updates and adjustments from time to time. While Israel is further tightening its defense capabilities, senior missile industry figures, in Iran for example, are burning the midnight oil in an attempt to devise a way of challenging Israel, despite all its missile interceptors. "We're looking many years ahead, and this is definitely a project of predicting the future. Yes, there's a lot of work ahead of us, because we're building our capabilities according to the development of the threats," says a senior Administration for the Development of Weapons and Technological Infrastructure source. That source, incidentally, does not completely rule out the idea that someone will one day also celebrate the air force's procurement of missile interceptors called Arrow 4. "At our Administration, there are always ideas and thoughts, and we're constantly examining technologies of various types that will be suitable in another 10 or 15 years," he says, without elaborating. IAI VP and Program Director for Air & Missile Defense Systems Boaz Levy adds, "The Arrow 3 system, a product of a development effort lasting many years, based on a multi-atmosphere solution invented by IAI, is today becoming a reality. This is a milestone for the defense establishment and the defense industry in Israel. The air force is receiving an additional air defense layer for high-altitude interception in outer space. Together with the Arrow 2, it is creating the best anti-ballistic missile defense solution. Many industries participated in the development by taking part in key building blocks in the project. These included IAI subsidiary Elta, Rafael Advanced Defense Systems Ltd., IMI, and Elisra." On a personal note, Levy added, "Today's delivery of the system to the air force constitutes the closing of a circle and the completion of a dream for me as the person who accompanied and led the development and planning of the system for many years." You comment was recieved and soon will be published. Thank you for posting your comment, which will be reviewed for publication. Arrow 3 launch in January 2014. 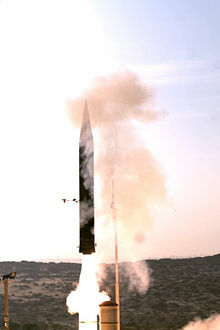 The Arrow 3 or Hetz 3 (Hebrew: חֵץ 3‎, pronounced [ˈχet͡s]) is an anti-ballistic missile, jointly funded and developed by Israel and the United States. Undertaken by Israel Aerospace Industries (IAI) and Boeing, it is overseen by the Israeli Ministry of Defense's "Homa" (Hebrew: חומה‎‎, pronounced [χoma], "rampart") administration and the U.S. Missile Defense Agency. It provides exo-atmospheric interception of ballistic missiles (during the space-flight portion of their trajectory). According to the chairman of the Israeli Space Agency, it is also possible that the Arrow 3 will serve as an anti-satellite weapon. The new component will also require the integration of longer range detection, tracking and discrimination capability, beyond what the "Green Pine" and "Super Green Pine" radars employed with the Arrow 2 are providing. Among the advanced sensors considered for Israel's future multi-tier system, are airborne electro-optical sensors deployed on high flying unmanned aerial vehicles and future enhanced "Green Pine" radars, as well as the AN/TPY-2 radar already deployed in Israel, and operated by U.S. forces. The multi-billion dollar development program of the Arrow is undertaken in Israel with the financial support of the United States. [hide]U.S. contributions to Arrow 3 program by fiscal year. Figures in millions of U.S. dollars. Arrow 3 launch in February 2013. An exo-atmospheric interception on December 10, 2015. IAI began preliminary tests of the Arrow 3 in 2011. The company will not specify what tests were performed, but they are part of the preparations for a full fly-out test. On January 23, 2012 the Israeli Ministry of Defense released photographs and video of the recent successfully fly-out tests from Palmachim Airbase. During the tests, a model of the interceptor missile was launched in order to check the starting and propulsion system, as well as other tracking sensors. On January 23, 2012 IAI announced an agreement to jointly work on the Arrow 3 with Boeing. Boeing is responsible for 40-50 percent of the production content of the Arrow 3. Expected work content includes motorcases, shroud, canister, safe & arm / ignition devices, power devices (batteries), and inertial navigation units, as well as several avionics packages and actuators & valves. On February 25, 2013 a fly-out test of the Arrow 3 was conducted from Palmachim Airbase. The launch tested the missile control and engines. According to a senior defense source, the missile obtained hypersonic speed, and reached an altitude of 100 km (62 mi), entering space. It followed various objects, such as stars, and gained further altitude. Its engine stopped after six minutes. On January 3, 2014 another successful test of the Arrow 3 was conducted from Palmachim Airbase. During the test the interceptor entered space and carried out a range of maneuvers in response to a virtual incoming enemy missile. The test involved the activation of two of the interceptor's engines, the first of which brought it into space, and the second allowing it to carry out complex maneuvers. On December 2014 a test aimed to debut an exo-atmospheric intercept capabilities of Arrow 3 has been characterized as a "no test", given that "conditions did not allow for" actual launch of the intercepting missile. On December 10, 2015 Arrow 3 scored its first intercept in a complex test designed to validate how the system can detect, identify, track and then discriminate real from decoy targets delivered into space by an improved Silver Sparrow target missile. According to officials, the milestone test paves the way toward low-rate initial production of the Arrow 3. On January 2017 the first Arrow 3 systems were delivered to the IAI, and were immediately integrated in existing operational missile defence system. 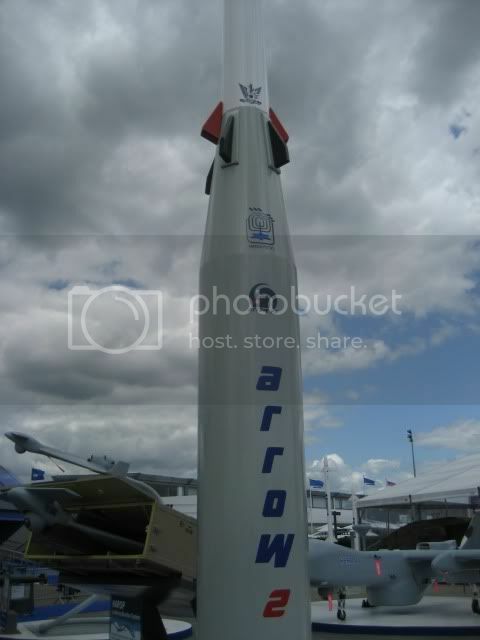 Israel Aerospace Industries announced in June 2009, that the Arrow 3 patented exoatmospheric interception method includes a two-stage interceptor, like the Arrow 2, but purely based on hit-to-kill technology. Unlike most kill vehicles, which use liquid or gas propulsion, the new Israeli kill vehicle will be propelled by an ordinary rocket motor equipped with a thrust-vectoring nozzle. It will also be fitted with a gimbaled seeker for hemispheric coverage. By measuring the seeker's line-of-sight propagation relative to the vehicle's motion, the kill vehicle will use proportional navigation to divert its course and line up exactly with the target's flight path. Joseph Hasson, chief missile designer at IAI, who patented the new kill vehicle with his colleague Galya Goldner, says that the concept is relatively simple, reliable and inexpensive, and is based on mature technologies. Furthermore, the kill vehicle's divert capability and agility reduce the need for detection and tracking systems, which usually accompany remote sensor-assisted exoatmospheric kills. 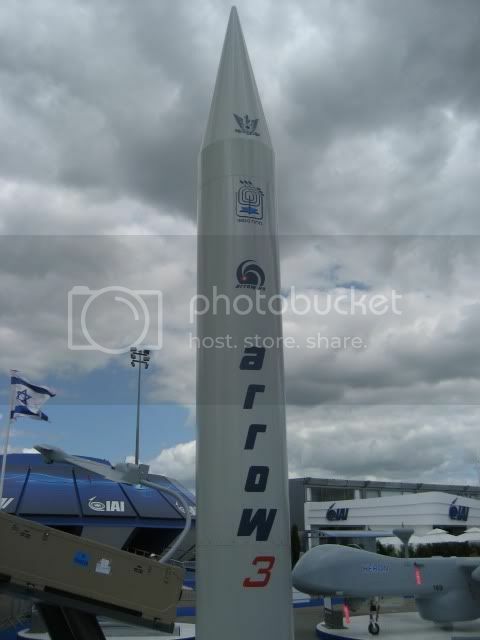 IAI displayed a full-sized model of the Arrow 3 missile and its kill vehicle at the June 2009 Paris Air Show. Arrow 3 should be able to intercept ballistic missiles, especially those carrying weapons of mass destruction, at altitudes of over 100 km (62 mi), and in greater ranges. It could also be ship-based. Arrow 3 is faster than the Arrow 2 and slightly smaller, weighing nearly half. An Arrow 3 battery is expected to intercept salvos of more than five ballistic missiles within 30 seconds. Arrow 3 can be launched into an area of space before it is known where the target missile is going. When the target and its course are identified, the Arrow interceptor is redirected using its thrust-vectoring nozzle to close the gap and conduct a "body-to-body" interception. Arrow 3 may have a reduced 30-year life-cycle cost. It should use the same launch system as Arrow 2. Reportedly it will cost $2–3 million per unit, while program cost is estimated at some $700–$800 million over three years. According to numerous Israeli experts, namely Prof. Yitzhak Ben Yisrael, former director of the Israeli Administration for the Development of Weapons and Technological Infrastructure and currently the chairman of the Israeli Space Agency, it is also possible that the Arrow 3 could serve as an anti-satellite weapon. 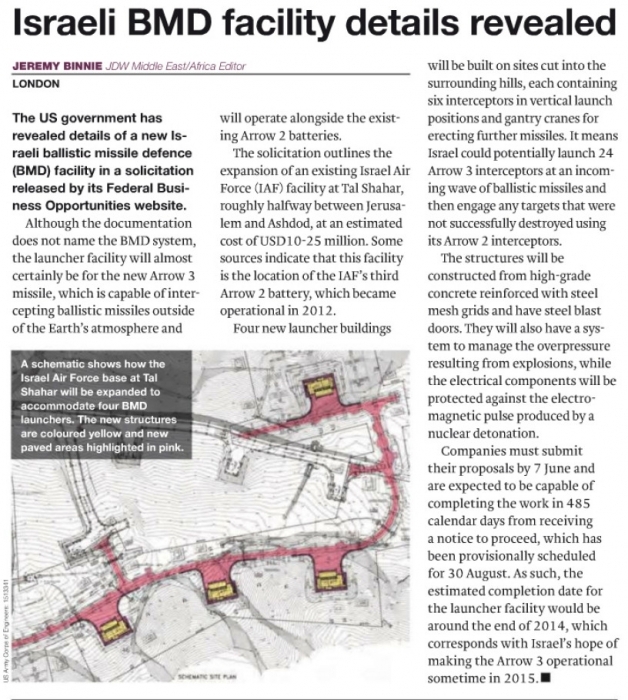 According to Jane's Defence Weekly, a solicitation that outlines the expansion of an Israeli Air Force facility at Tal Shahar, roughly halfway between Jerusalem and Ashdod, near Beit Shemesh, indicates that almost certainly it will be used for four Arrow 3 launchers on sites cut into the surrounding hills. The estimated completion date would be around the end of 2014. Each of the four launchers will have six missiles for a total of 24 interceptors. The plans for the base were revealed in a routine United States Department of Defense contract solicitation. Jump up ^ "Israel profile: Missile overview: Missile Chronology" (PDF). Nuclear Threat Initiative. January 2010. Retrieved 2012-04-03. ^ Jump up to: a b c "Israel, U.S. to embark on collaborative 'upper-tier' missile intercept program to include Arrow 3 and land-based SM-3 missiles". Defense Update. Retrieved 2009-08-19. ^ Jump up to: a b c d e Eshel, David (2010-02-12). "Israel upgrades its antimissile plans". Aviation Week & Space Technology. Retrieved 2010-02-13. ^ Jump up to: a b c d e f g h i j k l Sharp, Jeremy M. (2016-12-22). "CRS report for Congress: U.S. foreign aid to Israel" (PDF). Federation of American Scientists. Retrieved 2017-01-07. Jump up ^ Egozi, Arie (2011-08-02). "Arrow-3: a totally different layer of protection". 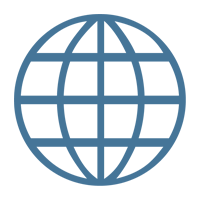 Flightglobal.com. Retrieved 2011-08-04. Jump up ^ "Defense Ministry conducts first test of "Arrow 3" system". Israel Defense Forces. 2012-01-24. Retrieved 2012-01-24. ^ Jump up to: a b Ben David, Alon (2012-01-26). "Boeing links up with IAI on Arrow-3". Aviation Week & Space Technology. Retrieved 2012-01-27. Jump up ^ "Arrow II brochure" (PDF). Boeing. March 2008. Retrieved 2009-08-19. Jump up ^ Lappin, Yaakov (2013-02-25). "Israel successfully tests Arrow 3 missile defense". The Jerusalem Post. Retrieved 2013-02-25. Jump up ^ Lappin, Yaakov (2014-01-03). "Defense Ministry: Missile shield system passes 2nd flight test". The Jerusalem Post. Retrieved 2014-01-03. Jump up ^ Opall-Rome, Barbara (2014-12-17). "'No Test' declared for Arrow-3 interceptor". Defense News. Retrieved 2014-12-19. Jump up ^ Amouyal, Noa (2015-02-25). "Israel DM: glitch in Arrow 2 missile fixed". Defense News. Retrieved 2015-02-27. ^ Jump up to: a b Opall-Rome, Barbara (2015-12-10). "US-Israel Arrow-3 intercepts target in space". Defense News. Retrieved 2015-12-10. Jump up ^ WO 2006003660, Hasson, Joseph & Galia Goldner, "Exo atmospheric intercepting system and method", issued 2006-01-12 . Jump up ^ "IAI develops Arrow 3 interceptor in response to longer range threats". Israel Aerospace Industries. 2009-06-10. Archived from the original on 2011-07-12. Retrieved 2009-08-19. ^ Jump up to: a b Richardson, Doug (2009-07-09). "IAI exhibits full-size Arrow 3 at Paris". Jane's Information Group. Retrieved 2009-08-19. See Arrow 2 and Arrow 3. Retrieved 2009-09-23. Jump up ^ "Arrow 3 brochure" (PDF). Israel Aerospace Industries. Retrieved 2012-03-25. Jump up ^ Ben-Yishai, Ron (2008-07-08). "US to help Israel develop Arrow-3". Ynetnews. Retrieved 2009-08-19. Jump up ^ Greenberg, Hanan (2010-05-27). "Arrow 3: The new generation". Ynetnews. Archived from the original on 29 May 2010. Retrieved 2010-05-27. Jump up ^ Opall-Rome, Barbara (2010-03-22). "Iran threat speeds Arrow-3 effort". Defense News. Retrieved 2010-03-22. Jump up ^ Fulghum, David (2012-09-03). "Higher-altitude Arrow design to show its potential". Aviation Week & Space Technology. Retrieved 2012-09-03. Jump up ^ "Eyeing Iran, Israel slates missile shield for 2015". Ynetnews. Reuters. 2010-11-15. Retrieved 2010-11-15. Jump up ^ "Israel asks U.S. to support Arrow-3". Defense Update. Retrieved 2009-08-19. Jump up ^ Opall-Rome, Barbara (2009-11-09). "Israeli experts: Arrow-3 could be adapted for anti-satellite role" (PDF). Imaginova SpaceNews.com: 16. Retrieved 2011-11-09. See also full article: #1 (2010-03-04). ^ Jump up to: a b Binnie, Jeremy (2013). "Israeli BMD facility details revealed". Jane's Information Group. Retrieved 2013-06-01. Jump up ^ Frenkel, Sheera (2013-06-03). "U.S. publishes details of missile base Israel wanted kept secret". The Miami Herald.